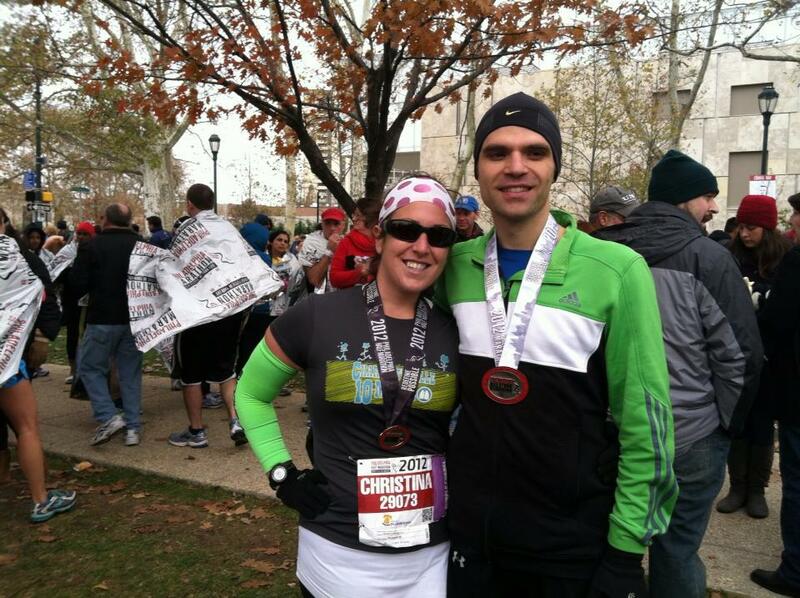 So this is WAY overdue but I do owe you guys a Philly Half Marathon Recap (I’m also going to write a review too but that’s much less run I think). 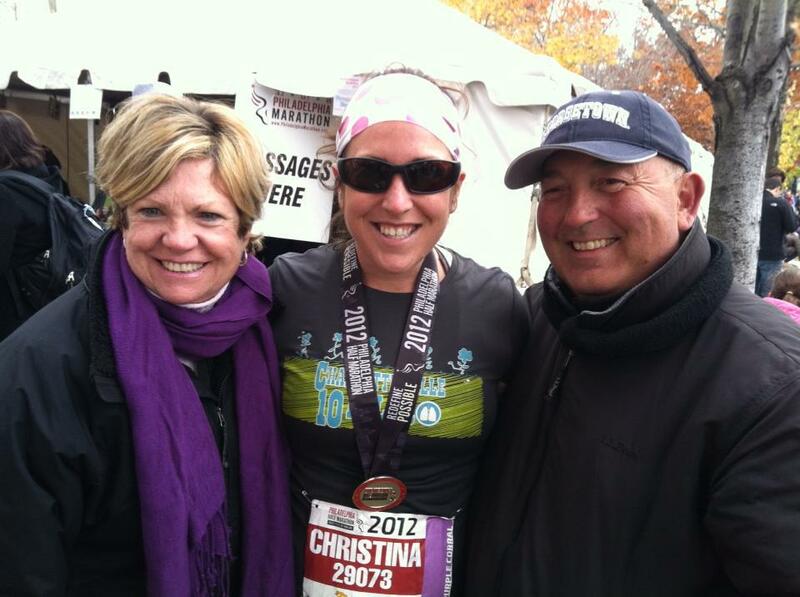 So OK The Philly Half Marathon… back story! I’ve alluded many times to my wildly successful LDF (long distance friendship) with my bff Sarah. She lives in Philly, I live in DC, I cried when I realized she wouldn’t be my roomie after college… but we’ve made the best of it! My parents are also originally from Philadelphia, and even though they raised my brother and I across the river in Jersey, we’ve always been Philly-lovers. 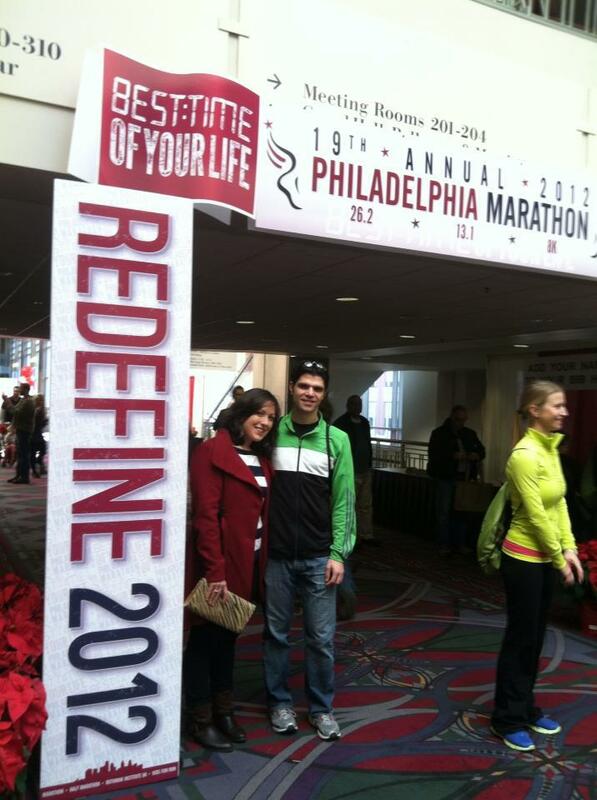 Needless to say, when Mike did not get a number for the NYC Marathon (which clearly ended up being a blessing) I was quick to suggest Philly as an alternate fall marathon choice. 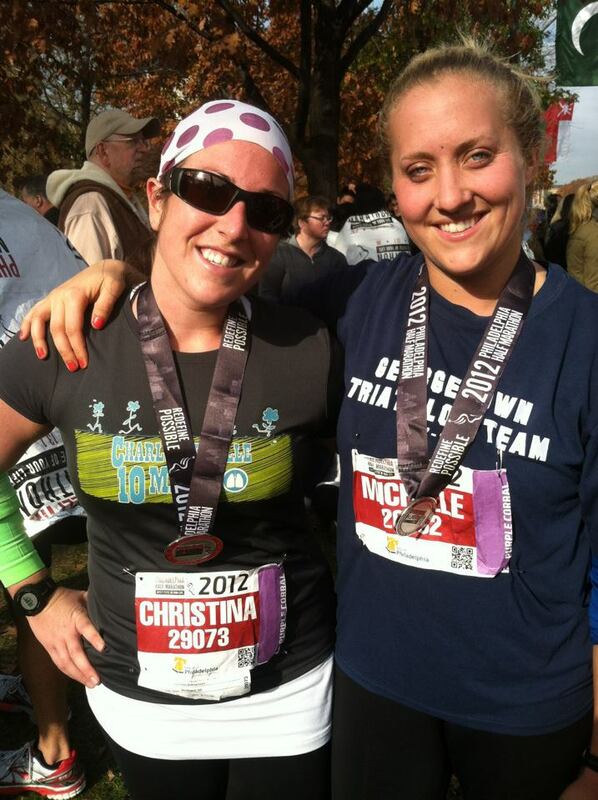 I decided to run the half too, just for fun! We went up to Philly on Friday night a little later than we planned. There was some horrible accident on 95 N that closed the entire highway. My parents were unfortunately sitting in traffic for over two hours, so we weren’t in any rush to get on the road. We waited until the highway opened up and arrived in Philly around 10:45 pm. After spending Friday night having fun, we spent Saturday morning hanging out, getting our bibs, and going to brunch at Amada. Unfortunately, this is where things started getting hairy. Both Mike and I got sick after eating at Amada. Our brunch group was three couples, so each couple shared a few of their tapas style small plates. Mike and I ate two items that no one else tried and I think something was not right there. Mike got sick immediately, but I felt fine at first so I didn’t think it was related to the food. Then a couple hours later… let’s just say I was convinced. I was less worried about me (at this point running a half isn’t a huge shock to my system) but I was really concerned about Mike. He was already worried about his ankle injury (he referenced it in his guest post) and now he was sick / getting dehydrated! We bought a ton of liquids at the CVS including Gatorade, Ginger Ale, Coke, and of course saltines. Things were touch and go there for a bit! It was COLD. It was going to be a great day for a race, but the morning was a little rough. I elected to go with capri pants, calf sleeves, tank top, short sleeve tech tee, arm warmers, gloves, and a headband I could pull over my ears. 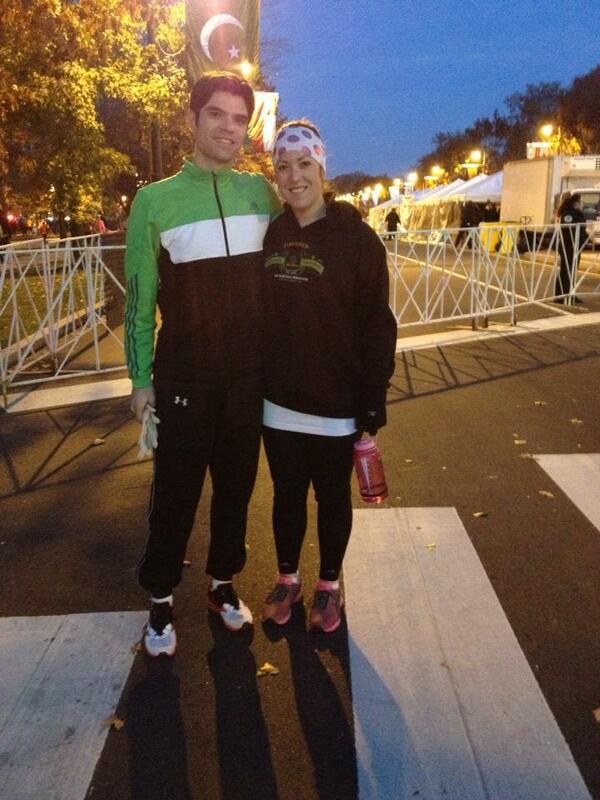 The sweatshirt was just for pre-race. Then we met up with my friend from Georgetown Michelle! 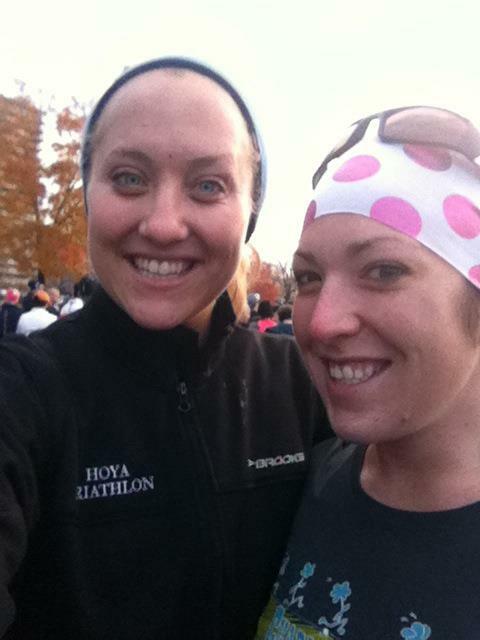 When we realized we both were running / aiming for approximately the same pace we decided to run together, which I loved. I NEVER have a running buddy, and normally I totally don’t mind running solo. Having a friend was such a fun change though! We said goodbye to Mike and wished him luck (he was in the first corral behind the elites so it was more important for him to be there before the gun. I’m usually far enough back that I have some wiggle room hehe). I was really worried about Mike. I made him promise me that if his ankle was in pain he would drop out of the race. He was going for a BIG PR, and I knew he was so focused that he would try and run through the pain. We had a lot of talks before the race about how our #1 goal is to be runners for a long time, so sometimes that means making short term sacrifices. Mike is such an intelligent runner, but he is really driven. We both use each other to talk through these kinds of situations… which is awesome. Michelle and I lined up and before we knew it the sun was up and we were crossing the starting line and heading down towards Love Park. We fell into a pretty easy pace right out of the gate. I was so cold by the time we started, I kind of felt like my legs weren’t even attached to my body. It was also really crowded. I absolutely loved that they opened up 3,000 additional spots in the race for displaced New Yorkers, but that’s another 3000 bodies on the course so this was kind of inevitable. I didn’t mind it though… Michelle and I were having a BLAST already. We ran down a few miles and ended up on Front Street. We made a quick unsanctioned bathroom stop behind some very full bushes. There were a bunch of other ladies back there so it was cool. SORRY but the lines were SUPER long and we really had to go. This is running folks. We made the turn and headed up onto South Street. The crowds here were awesome with a ton of music playing. We even ran past the restaurant we ate at on Saturday night! I kind of wanted to pop in for a quick spaghetti but I didn’t have time 🙂 We went up a few blocks and ended up on Chestnut Street. This is when I started looking for people. I thought Sarah might be out around 15th and Chestnut but I later found out she was still in bed (SLACKER! hehe just kiddingg). I spotted my parents at about 21st and Chestnut because my mom was waving her cow bell like crazy. I threw my hands up in the arm to get their attention and my dad snapped an AWESOME pic of us. I kind of wish I had it (HINT HINT… DAD!). We left Center City behind and ran over the bridge towards Penn where Michelle is currently in grad school. My dad has his PhD from Penn so it was fun to try and spot landmarks I recognized. I knew that the first hills of the race were coming (up until this point it had been pancake flat). 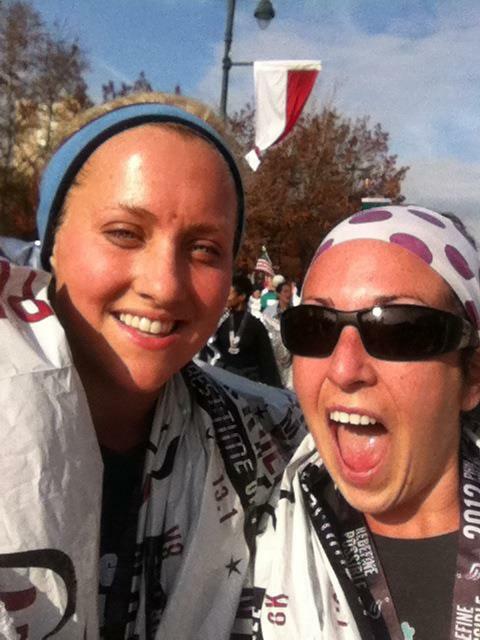 Michelle and I were holding a really steady pace, laughing / talking the whole time, and just enjoying the crowds. Some of the other runners were really friendly too. Around mile 8 we started looking out for Michelle’s boyfriend Gabe, but I don’t think we ever found him! I took a Chocolate GU… because it tastes like chocolate frosting and I love it. We passed the zoo and I knew the “big hill” was coming (biggest of this course at least). It passed pretty much without incident and before I knew it we were at the Please Touch Museum. If you haven’t been there before you should go… or take your kid. I distinctly remember my Aunt Gloria taking me there when I was little (I’m pretty sure it was a different location at that time, but my child memories don’t include a lot of directions). Then we started my favorite miles of the while race. There were almost no crowds running through the park, but I didn’t need them. The race crowd was enough for me and I just drank in the beautiful fall scenery. It was absolutely gorgeous. Before I knew it, we were passing mile marker 10 and heading back towards the Art Museum. I knew there was going to be one little hill before heading to the finish line. It was really small, but sometimes a small hill at the end of a race that you’re not expecting can really get you. I wanted to be prepared. Finally, we passed in front of the Art Museum and I was sprinting to the finish line! I said goodbye to Michelle. She had to go do homework… BOO. I was on the phone trying to coordinate meeting up with Mike’s parents when we decided to make our way to the marathon side to wait for Mike. I’m normally never a worrier, but I was definitely feeling some nerves for him. Only because of the injury and getting sick… and, well, I love him so deal with it. I saw one of the guys from our running club finish and knew Mike shouldn’t be too far behind him. Just as I was starting to really freak out, THERE HE WAS! 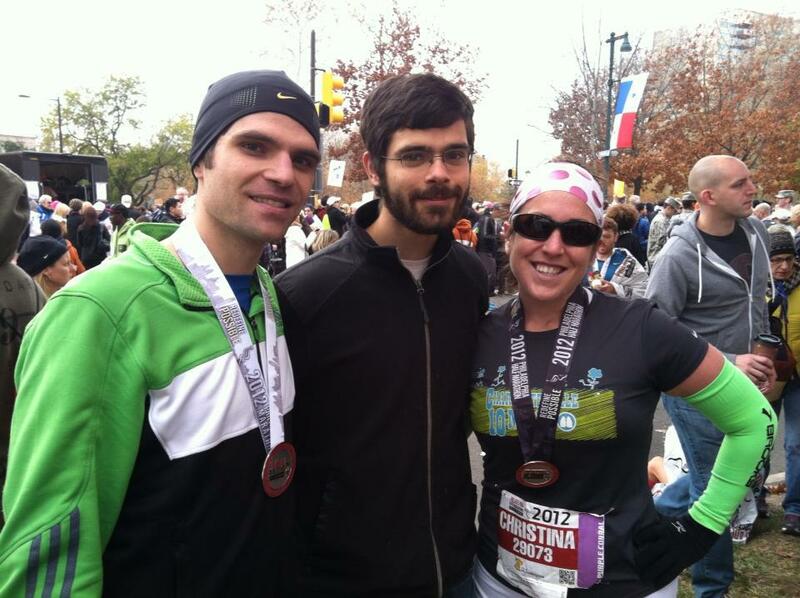 We had a really awesome sweaty runner hug and he shared his big news… he beat his goal!!!!! 3:14:22 for this guy right here. I am once again exceptionally proud of him. I had a fun race with my friend… but Mike was the one to celebrate 🙂 After he stretched I made him take 1000 pictures. It was freezing and at one point Mike was wearing his mom’s down coat to warm up. I took like 30 pictures of him in that coat without him looking. I’m sure he’s really going to appreciate seeing them on the blog. Love you honey! Family love fest ensued and I even bought a couple soft pretzels from a guy selling them out of shopping cart (if you’re not familiar, Philly soft pretzels are the best when sold to you out of shopping cart in a brown paper bag… seriously) They were totally price gouging everyone though… $9 for 3 pretzels!!! Normally they’re like 75 cents a pop but it was worth it. After the race it was ice bath time! Mike was the one who really needed it, but I hopped in after for good measure. I think the hat really helped… not at all. Then we went to Schlesingers (one of my FAV Philly places). I ate 100 pickles from the pickle bar, matzoh ball soup, and some errrrrgggssss (that’s how I say eggs when I’m really hungry). Final Summation: Great Race for both of us. Great for me because I had fun and enjoyed the run. I’m normally pretty head down and focused when I’m racing, but this time I really took in the scenery and enjoyed the experience. You can’t “race” every race after all. This race was the perfect way to focus myself for marathon training and remind myself why I love this sport so much. 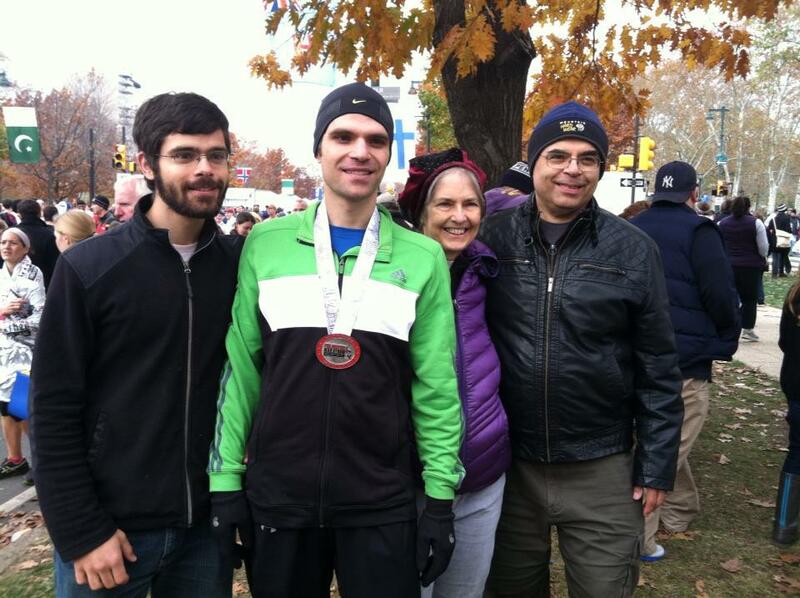 Great race for Mike because he accomplished a huge goal in the face of some serious adversity. His foot has been bothering him since, so he’s been resting at my insistence. Next up… Surf-n-Santa 10 Miler!! Sounds like a really fun race! Congrats! Yay! Congratulations to both of you for having such a great race despite the food poisoning! Mike’s time is incredible! I’ve never had to take an unsanctioned restroom stop, but I bet it would be funny to step behind some bushes and see a bunch of peeing runners! He said thank you!! I can’t believe that happened the day before the race but you know we just like to keep things exciting!